LONDON—While adding multiple new gameplay options and challenging story paths to their retro farming RPG Stardew Valley, developer Chucklefish Limited revealed Friday that an upcoming game expansion would allow players to shoot themselves in the barn after losing their farm to corporate agribusiness. 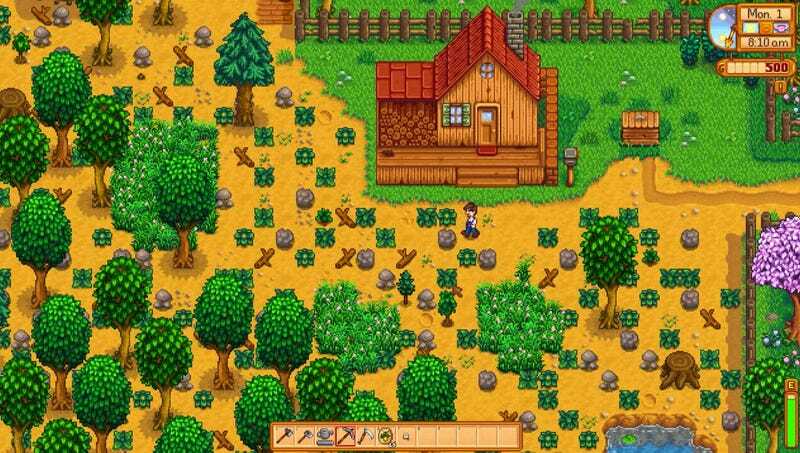 “Stardew Valley’s latest update includes all kinds of fun new farm life challenges, including collecting minerals to restore your grandfather’s old shotgun, which you can then use to chase off the bank officials who come to foreclose on your land or even place in your character’s mouth and pull the trigger after you realize you’ve lost everything,” said spokesperson Dana Farrow, explaining that players would also encounter new relationship events such as having their wife and child abandon them as the spiral of bankruptcy plummets past the point of possible recovery, or joining with townspeople Shane and Clint in succumbing to the opioid epidemic after the nearby mines close. “Players can also use the new axe and sledgehammer functionality to put down their starving cows and horses after corporate competitors lobby to cut off your water supply. Of course, there are now even more choices to make in the more realistic endgame: you can always sell your farm back to the bank at a massive loss and become a laborer at the fracking camps in Cindersap Forest, or brew the new moonshine and grain alcohol crafting items and drink yourself to death at Stardrop Saloon.” Farrow added that the expansion would also include an expanded weather system in which climate change will slowly transform the fertile valley into an arid wasteland.